Earl Waltheof, being accused of treason by Judith his wife, was kept for a year in prison at Winchester, where he confessed his sins to priests, weeping in a spirit of humility and with a contrite heart and reciting the psalter which in childhood he had learned to sing every day, turning his whole mind towards the worship of the Lord God. But then the Normans, who were his enemies and coveted his estates and privileges, sought the judgement of his death in the king’s court, and he was sentenced to be executed on a hill outside the city of Winchester on 31st May, early in the morning: his head was cut off and his body thrown into a ditch and covered with green turf. At this execution a miracle took place worthy of being remembered: when on bended knee, raising up his eyes and hands to heaven, he began to say the Lord’s Prayer, but was not able to complete it because his voice was interrupted by tears. After his head was cut off a clear and audible voice completed it in the hearing of all who were present, saying, ‘But deliver us from evil, Amen’. 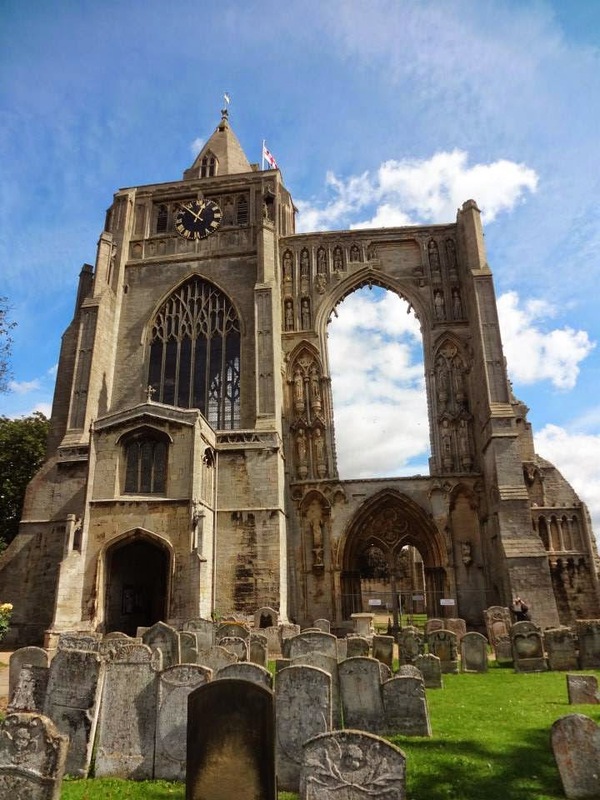 After 15 days, his wife Judith requested the permission of the king that Ulfketel abbot of Crowland should have the body of the holy earl, still intact and bloody as on the day that the man of God was killed, carried to Crowland; and the chapter of the monks reverently buried him, and upon his tomb, according to some, Judith laid a silken cloth after some time had passed, which by divine power was pulled away, as if by a violent wind. Waltheof was the only Englishman executed under William the Conqueror (though plenty were killed in battle). No wonder the monks of Crowland were prepared to call him a martyr! Brings the earth to life. God calls up the flowers! Spring leads death to life. Creep the flowers of Spring. Some person of very good taste chose the following hymn for Radio 4's 'Sunday Worship' programme this morning, which greatly pleased me; and so here it is. Like this wonderful carol, it was written by J. M. Neale in 1853 to fit a tune in the medieval music compilation 'Piae Cantiones' (the tune is named 'Scribere prosposui', and may or may not be the same as this tune, I'm not quite sure.). While Paul was waiting for them in Athens, he was greatly distressed to see that the city was full of idols. So he reasoned in the synagogue with both Jews and God-fearing Greeks, as well as in the marketplace day by day with those who happened to be there. A group of Epicurean and Stoic philosophers began to debate with him. Some of them asked, “What is this babbler trying to say?” Others remarked, “He seems to be advocating foreign gods.” They said this because Paul was preaching the good news about Jesus and the resurrection. A pretty great topic for a hymn, I think you'll agree. The tune in The Oxford Book of Carols is harmonised by Geoffrey Shaw, and for my money is considerably more sane than that medieval tune; sadly I can't find it online, but for the next week you will be able to listen to it on iplayer, at 11:38 mins in. In grave and rev'rend number. One cradled in a manger. I've glanced over this hymn several times in the past and never got past the first two verses, which for some reason don't much appeal to me; but verses 3 onwards have a simple plaintive honesty that is rather moving, especially on a 'dark room' kind of day. Because I was thinking about Canterbury, here are some more-or-less randomly-chosen pictures of my favourite cathedral. This is its most famous part, the site of Thomas Becket's shrine. This was the destination of many thousands of medieval travellers, including but not limited to Chaucer's pilgrims, St Eysteinn, and an Icelander named Hrafn Sveinbjarnarson who presented the tusk of a narwahl at Thomas' shrine to thank the saint for a good catch. (Part of me really hopes they still have a narwahl tusk in a cupboard somewhere at Canterbury). The shrine was, of course, destroyed at the Reformation, so the site is marked by the candle in the bottom-left corner. And to the outside - this is the ruins of the medieval abbey of Christ Church, where the monks lived who served the cathedral. Thanks, Henry VIII! For more, see Canterbury by Candlelight and The Stained Glass of Canterbury. The days between May 25-28 are variously dedicated in the church's calendar to four of my favourite medieval people: Bede, St Augustine of Canterbury, King Ethelbert of Kent, and his wife Bertha. As the latter three are traditionally held to be responsible for the establishment of the English church, and the first is our best source for how it happened, it seems appropriate to post Bede's account of Augustine's arrival. We begin in 597, when Augustine was sent from Rome by Gregory the Great to evangelise the English people. On the east of Kent is the large Isle of Thanet containing according to the English way of reckoning, 600 families, divided from the other land by the river Wantsum, which is about three furlongs over, and fordable only in two places, for both ends of it run into the sea. In this island landed the servant of our Lord, Augustine, and his companions, being, as is reported, nearly forty men. The king having heard this, ordered them to stay in that island where they had landed, and that they should be furnished with all necessaries, till he should consider what to do with them. For he had before heard of the Christian religion, having a Christian wife of the royal family of the Franks, called Bertha; whom he had received from her parents, upon condition that she should be permitted to practice her religion with the Bishop Luidhard, who was sent with her to preserve her faith. When he had sat down, pursuant to the king's commands, and preached to him and his attendants there present, the word of life, the king answered thus: ­ "Your words and promises are very fair, but as they are new to us, and of uncertain import, I cannot approve of them so far as to forsake that which I have so long followed with the whole English nation. But because you are come from far into my kingdom, and, as I conceive, are desirous to impart to us those things which you believe to be true, and most beneficial, we will not molest you, but give you favourable entertainment, and take care to supply you with your necessary sustenance; nor do we forbid you to preach and gain as many as you can to your religion." And there they have been ever since... 1500 years and counting. 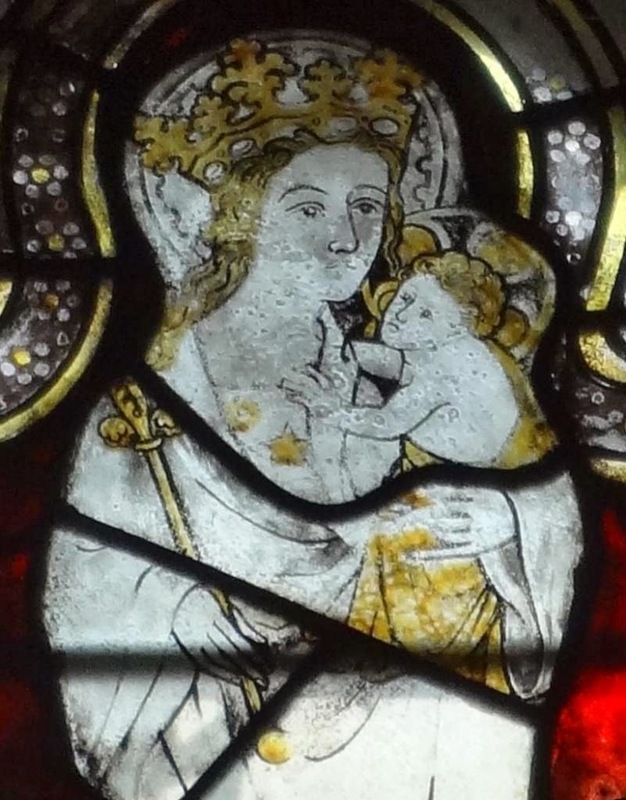 Pictures from Minster-in-Thanet, Fritton, Norwich and Canterbury (of course). 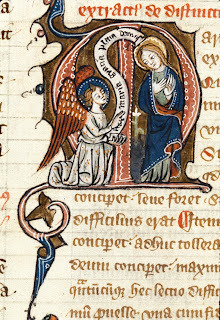 This is a thirteenth-century Annunciation lyric from the manuscript Cambridge, Trinity College B.14.39. 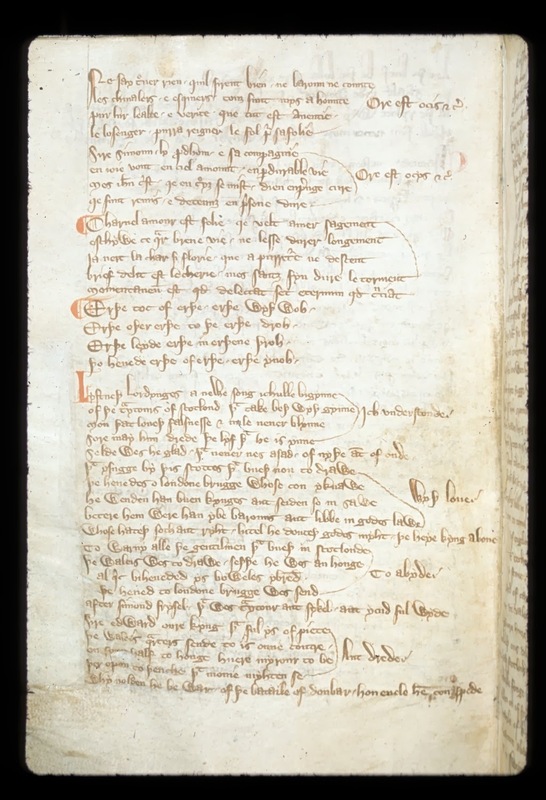 It shares some lines with the more famous I sing of a maiden (which may be partly based on this poem); like 'I sing of a maiden', with its 'dew in April which falleth on the spray', the first verse of this poem makes it particularly appropriate for spring, when the Annunciation is traditionally commemorated. 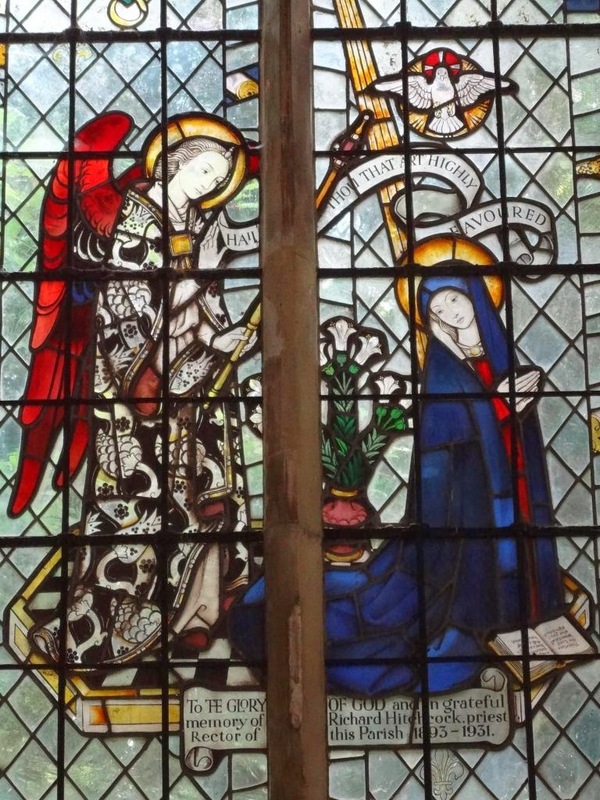 The Feast of the Annunciation was often known as 'Our Lady Day in Lent', to distinguish it from other days associated with the Virgin. That lesed al of pine that aree was forlore. The king of all kings as mother he her chose. Gabriel her greeted and said to her, "Ave! The fruit of thy womb, blessed may it be. Thou shalt be with child, in truth I say to thee." She began to think and ponder in her thought. She said to the angel, "How may this be? Of man's touch know I nothing, indeed." Well might she bearer of God's Son be. Who released all from pain that ever were forlorn. 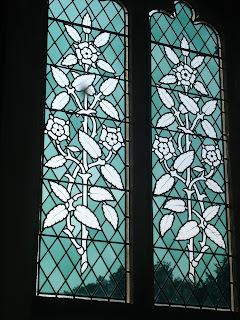 The lower two pictures are from the church at Fordwich, Kent. 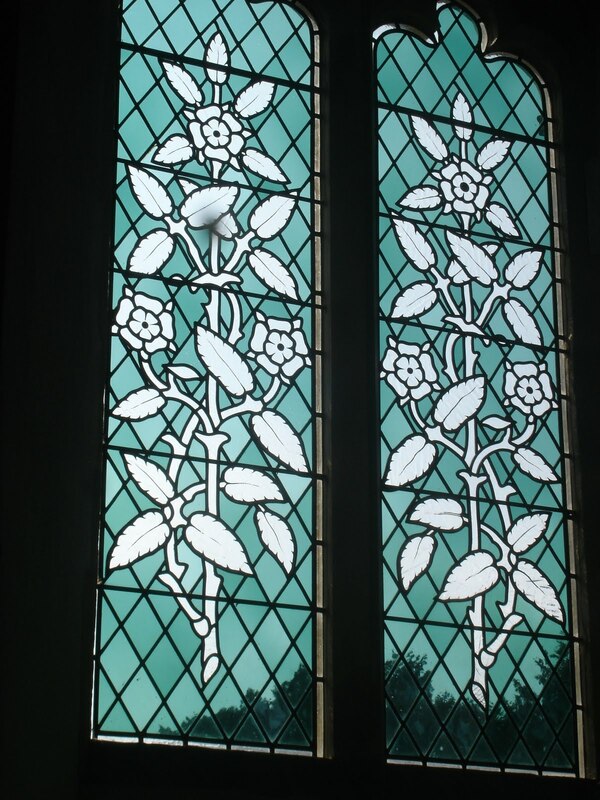 Just so that the top post on the blog isn't a picture of a skull and musings on mortality, here are some random pictures of stained glass. Because it's pretty.